Ever wonder what it might feel like to be stalked by a tiger? New drone footage from China will give you a thrill, though the backstory might bring you back down. 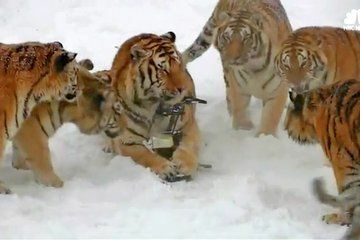 Footage released by the Chinese state broadcaster CCTV shows Siberian tigers at the Siberian Tiger Park in Harbin, a city in northeast China, sprinting after an airborne drone in the February snow. According to CCTV, park officials use the drones to exercise the big cats and help them drop the pounds they pack on over the cold winter. The video has gone viral, but the story behind the tiger park is not all fun and games. The park has been accused of not being a true tiger sanctuary, but rather a "tiger farm" — a breeding site where dead tigers are eventually harvested for their pelts and bones, which are used in traditional Chinese medicine to make wine. In 2014, a reporter from the McClatchy news agency visited the Harbin park and found that many of the tigers held there were kept in small cages, "visibly rolling in their excrement." Bottles of wine were for sale that employees said were made from tiger bone, which is officially a banned product in China. The drone video is "a distraction from quite a sinister and dark reality," said Debbie Banks, head of the Tigers Campaign at the London-based wildlife advocacy group Environmental Investigation Agency. "Those tigers are going to end up being turned into tiger bone wine or made into tiger skin rugs." There are only about 360 Siberian tigers living in the wild, according to the International Union for Conservation of Nature (IUCN), which lists the species as endangered. News reports peg the number of Siberian tigers at the Harbin park alone at between 500 and 1,000. Tiger farming and selling farmed tiger pelts is legal in China, said Banks, while trade in the bones has been banned since 1993. Still, the system sees its share of abuses. "We've met with a taxidermist, for example, who was legally buying skins from zoo tigers, and when the consignment was delivered to him, it was actually the entire tiger," Banks told Live Science. The same taxidermist offered customers a discount on pelts if they returned the official certificate that accompanies legal hides to him after the purchase, she said. He would then reuse the certificate for illegally traded hides. The Chinese government claims that parks like the one in Harbin and another large park called Xiongsen in the city of Guilin are for the purposes of conservation, Banks said, but the animals are often inbred and could never survive outside the parks. As the drone video shows, the tigers are kept in large groups, despite the fact that they are largely solitary in the wild. A 2013 report by the EIA argues that rather than protecting wild populations, tiger farming stimulates the market for tiger products, which in turn encourages poaching, because it's cheaper to kill a tiger in the wild than it is to raise one in captivity. Conditions at tiger farms may not live up to high standards of animal husbandry. Numerous reports from people who visited the Harbin park tell of visitors buying live chickens and hunks of meat to throw to the tigers. In 2011, the driver of a tourist bus at the Harbin park was mauled to death by a tiger after leaving his vehicle when it got stuck during a tour, according to news reports. In 2016, a reporter from the South China Morning Post magazine visited Xiongsen and photographed emaciated tigers in featureless enclosures. Housing tigers communally is probably stressful for them, said Brian Aucone, senior vice president for animal care and conservation at the Denver Zoo, which is in the process of opening a new tiger habitat. The enclosure in the video looks fine — for a single tiger, Aucone said. The drone chase may also be a source of stress, he said. "It seems a bit teasing to them, from my perspective," he said. The end of the chase doesn't come with a food reward, he said. Instead, it's a potential health risk for the big cats. "You've got battery material that they could easily bite into that's toxic, so the fact that they are able to get ahold of the drone is certainly concerning," Aucone told Live Science. There are probably between 5,000 and 6,000 captive tigers in China, Banks said, and there are many living conditions that are worse than those found in the Harbin and Xiongsen parks, which tend to attract international criticism and media attention due to their size. Thailand, Laos and Vietnam are also home to "safari" parks linked to the illegal trade of tiger bones, Banks said. "Many, many of the tigers in captivity across China are seen in concrete enclosures," Banks said. "There is no habitat enrichment whatsoever."